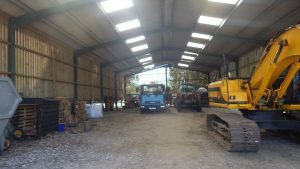 In order to support the prior approval for the change of use of the agricultural building to a dwelling a Phase I Desk Study report was required to assess the potential contamination risks on the site. Demeter Environmental were commissioned in September 2016 to prepare the desk study report. Prior to the site reconnaissance visit, the desk based portion of the desk study (review of O.S maps, aerial plates, information in the public domain, BGS geological maps etc. ), which indicated the site was undeveloped prior to 2010, a single in-filed pond was identified to the east of the site. The geological maps revealed deposits of alluvium were present to the north west of the site. plant, whilst the floor was exposed earth there was no visual evidence of hydrocarbon releases. Cement sheeting was identified in the building structure, and as no damage was observed the sheeting was discounted as a credible source. Made ground was identified on the site during the walkover survey. Whilst potential sources of contamination were identified, given the low risk posed by the site remediation in lieu of intrusive investigation was regarded as the most appropriate way forwards. The incorporation of gas protection measures as an alternative to ground gas monitoring was chosen by the client and agent as the most appropriate way forwards. The desk study was submitted to with the application (3PN/2016/0054/UC), (the desk study report is the three ‘Contaminated Land Documents) which was accepted by the contaminated land officer (‘Contaminated Land Comments’ of the 12th September 2016). In order to have the remediation scheme approved by the local authority Demeter Environmental were commissioned to prepare the Phase IIIa Implementation Plan to ensure all parties were aware of the specification of the remediation. 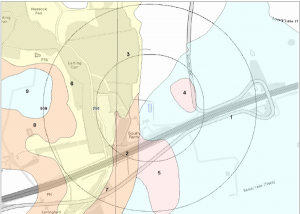 The Phase IIIa plan (which can be accessed from the documents section) was submitted under a discharge of conditions application (3DC/2017/0021/DOC), the memo from the contaminated land officer accepting the remedial proposals is also available of the Breckland Planning Portal (‘Contaminated Land Officer Comments’ of the 8th March 2017). As of April 2017 the development had not commenced.